The module can be downloaded by logging into our website using the account that holds the subscription and heading to Downloads >> My Downloads area. The RSShowcase! Module was designed for displaying multiple thumbnails of images pulled directly from RSMediaGallery! through the use of tags. It is also capable of synchronizing with Pinterest and Flickr so that you can display, on your website, pictures that you have uploaded on your profiles. This article consists of a step-by-step guide that will take you through the entire installation and configuration process. 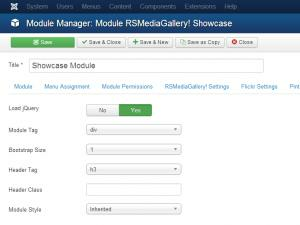 Installing the module is done in the Extensions >> Extension Manager area, in your website's backend. Please read this Installation Guide for more information. 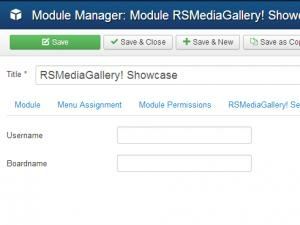 Note: The module can be used as stand-alone, meaning that you don't necessarily need RSMediaGallery! for it to work. 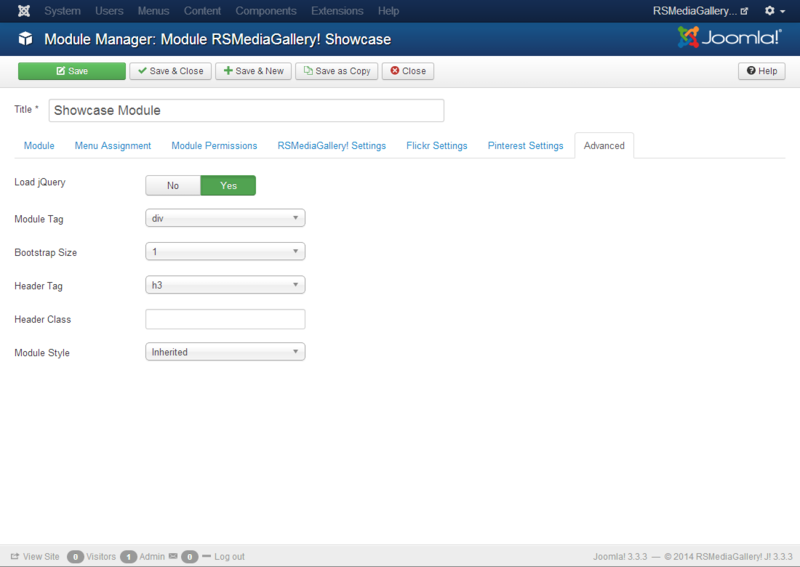 You can just synchronize it with either Flickr or Pinterest, leaving RSMediaGallery! completely out of the question. Source: RSMediaGallery! / Flickr / Pinterest - choose in which mode the module should function. It will either pull images from RSMediaGallery, Flickr or Pinterest. Configuring the Flickr and Pinterest integrations is explained below. Thumbnail Size: Set the width of the images thumbnails, the same height will be applied. They will be displayed as squares in order to maintain a fixed aspect ratio for all thumbnails. 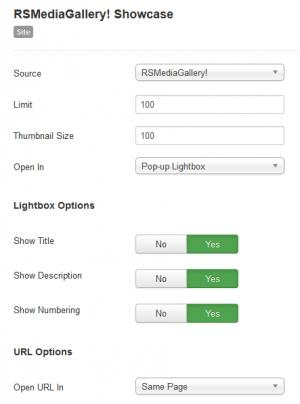 Show Numbering: Yes / No - This setting applies when an RSMediaGallery! image is viewed inside a slideshow. Set to Yes in order to show the image's number in the gallery's total. 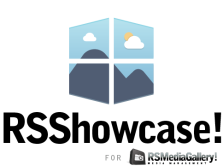 Open URL in: Same Page / New Window - If Open In is set to URL, the linked page will either be opened in the same tab or in a new one, depending on the option chosen here. Load jQuery: Set this option to Yes if you do not have jQuery on your website (recommended for Joomla! 2.5). 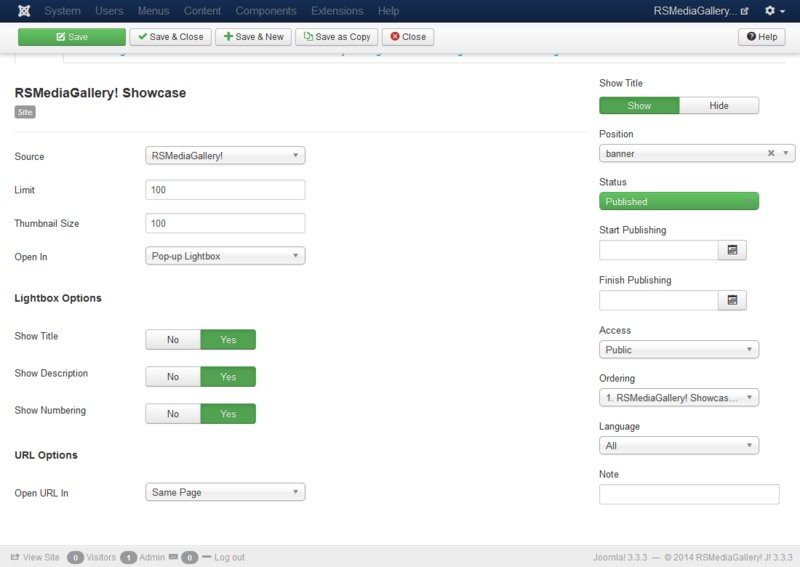 You can set this to No if you are using Joomla! 3.x, as it includes jQuery by default. In this tab of the RSShowcase! 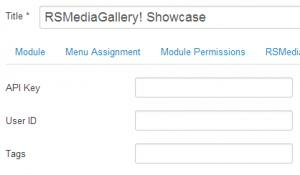 module, you can select what RSMediaGallery! photos to be displayed by adding the tags that they are associated with. 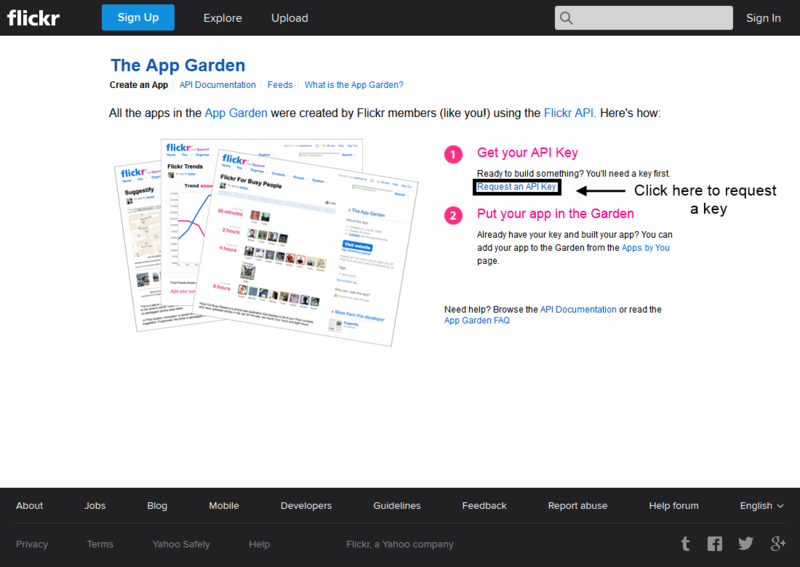 Flickr API Key: You can get your API key by logging in to Flickr and following this link. Have a look at the Image 1.1 below to see where exactly on the page you can find it. ID: The ID can be retrieved by following this link (being logged in to Flickr is also required). This is shown in Image 1.2 below. 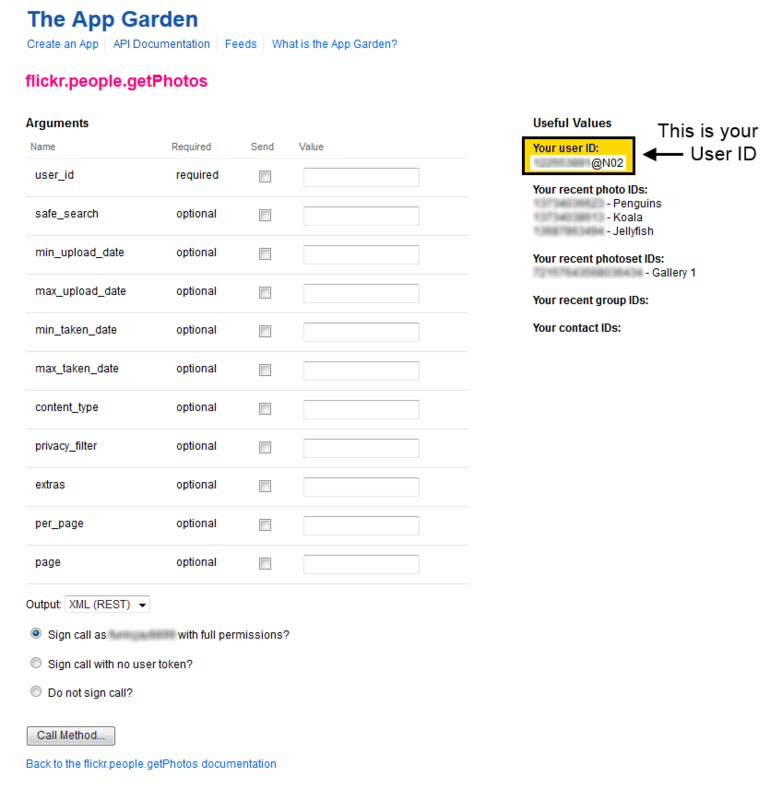 Select ID Type: User / Group - used in conjunction with the ID field presented above, here you will need to specify whether the ID corresponds to a particular user or a group. 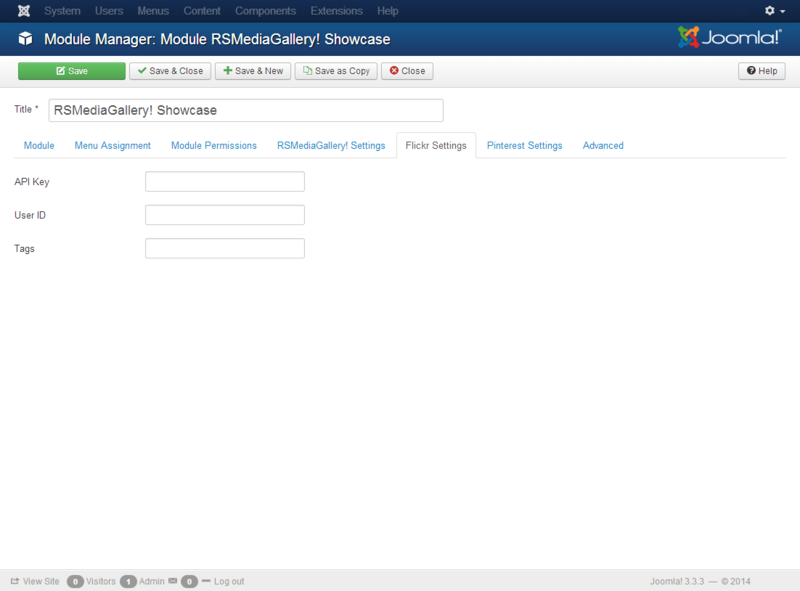 NOTE : If you modify/delete the pictures from the Flickr account, you will have to clear Joomla! 's cache.